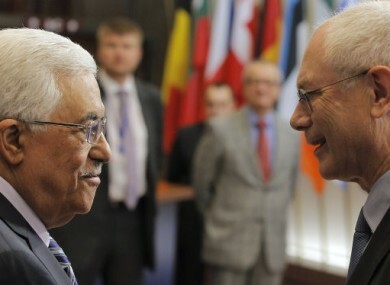 European Council President Herman Van Rompuy, right, talks with Palestinian President Mahmoud Abbas, prior to a meeting at the European Council. TAOISEACH ENDA KENNY will join a number of European leaders including Angela Merkel and Mariano Rajoy at the summit of the European People’s Party (EPP) in Brussels this afternoon. The summit comes ahead of a meeting of the European Council which will begin later this evening before continuing tomorrow. The European Council is expected to discuss issue of migration following the recent Mediterranean sinkings off Italy and Malta that lead to the deaths of hundreds of refugees. Several leaders called for a legal migration policy and more resources to fight illegal immigration. Italy in particular has appealed for more help from other European countries to deal with the sharp increase in refugee arrivals. The economic recovery and the EU budget will also take centre stage during the two day talks. The leaders of the four largest political groupings in Europe yesterday united to express their deep frustration at what they called the “gaming tactics” of some member states over the EU budget. In a statement released ahead of the meeting Taoiseach Enda Kenny said his priorities for the summit were to contribute to discussions on the digital economy and in particular its potential to combatyouth unemployment. Kenny also said that he wished to urge European partners to reach agreement on the final elements of banking union. “The issues involved are complex and sensitive but it is time now to move forward and finish the job, ” he said. We need to make good on the agreement to break the vicious circle between banks and sovereigns. As I have consistently said, it is vital to the Union’s credibility that decisions taken by leaders are implemented in full. An Taoiseach also noted that the meeting beginning today will be the last such meeting before Ireland’s planned exit from the EU/IMF bailout programme in December. He said that he has written to the European Council members ahead of the meeting about Ireland’s upcoming return to the sovereign bond markets. This he says must be “sustained and durable” and that he hopes to brief European leaders on this over the course of the meeting. Email “Taoiseach to attend EU Council meeting with migration top of the agenda”. Feedback on “Taoiseach to attend EU Council meeting with migration top of the agenda”.